This lovely spring mix of flowers on my dining table is an all-sided arrangement….so no matter where you sit at the table, you are welcomed by some beautiful blooms. I also clustered a few blooms together to get a stronger impact in each section of the arrangement. But if you have just a few blooms, then selecting an interesting vessel is all that is needed. You can see here that I have a dining nook rather than a dining room, so I usually use a vase that calls for just a few flowers. 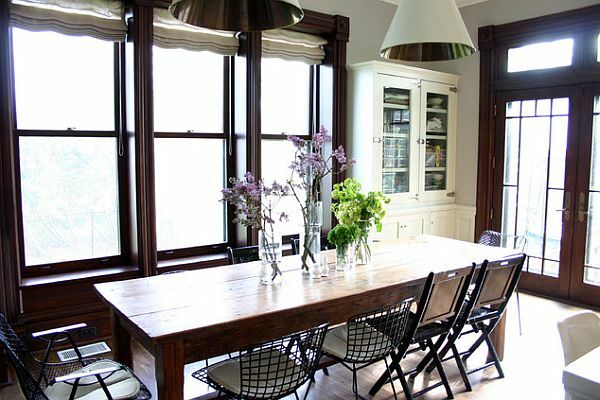 If you have a large open dining space, then long flowers and big vases can be used. Let’s look at some examples. 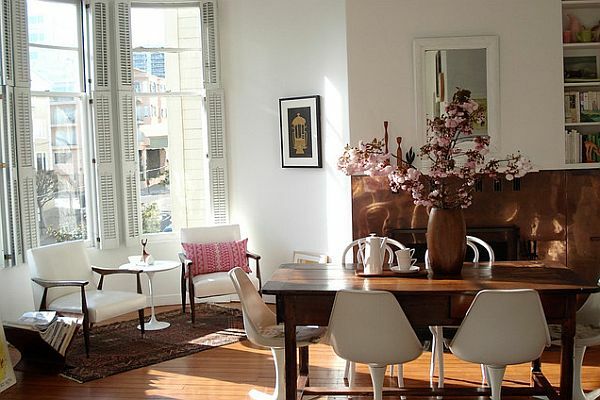 Photos from Decoist. White and green (or even yellow) can be combined with a darker table and brighter kitchen cabinets. And a long table allows for multiple vases. 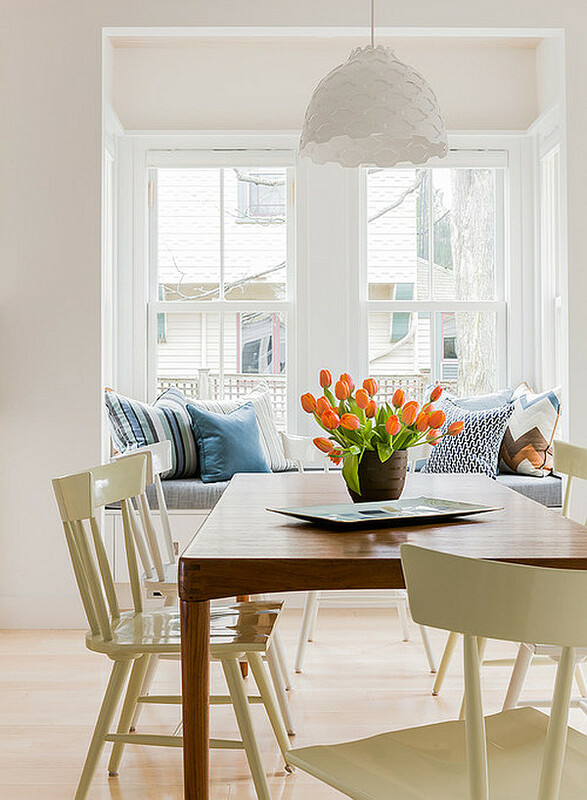 This more intimate dining table requires a slender vase, however, the tall blooms work well because the space feels open and airy. Using accent colors coordinates creates harmony in a space. 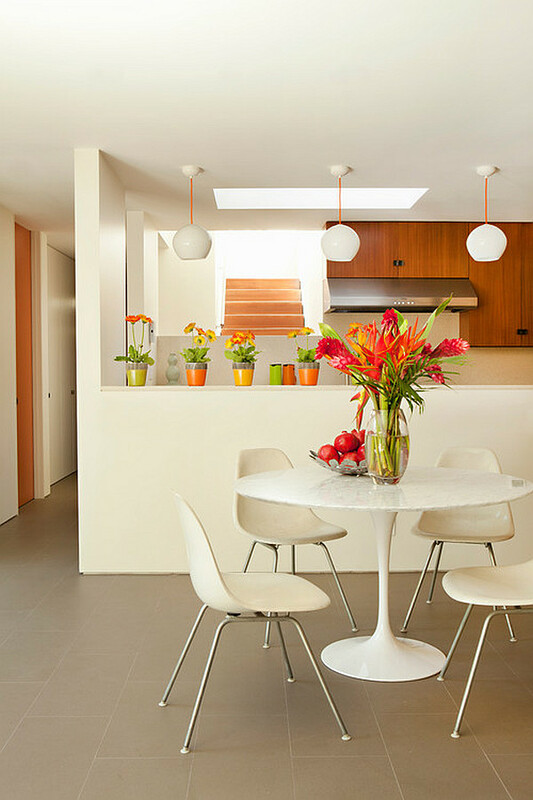 This contemporary kitchen lends itself to a more contemporary floral arrangement….thus a sleek shaped vase filled with brightly colored tropical flowers works perfectly here. Another great example of using accent colors to bring cohesion to the space. LOVE how those pink branch blossoms bring out that pink pillow. And that dark wood vase picks of the deep dark browns of the room. Open airy space allows for open airy blooms. If not pulling accent colors, then selecting bloom colors that contrast your wall colors really helps the flowers pop. Here is another example of using a contrasting color from the white walls. Your eyes go right to the pink blooms on the table. This photo provides an example of creating floral arrangement that works with the whole room. 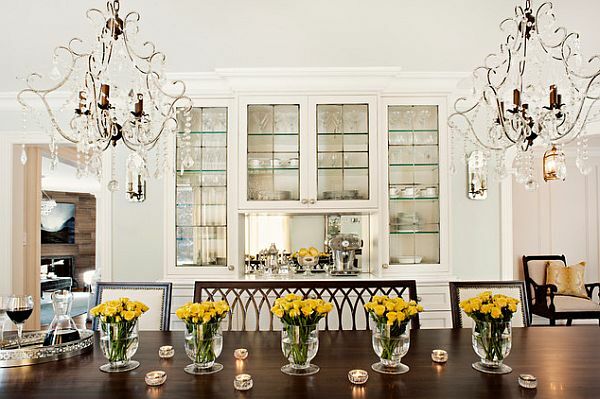 A long table allows a long slender arrangement. 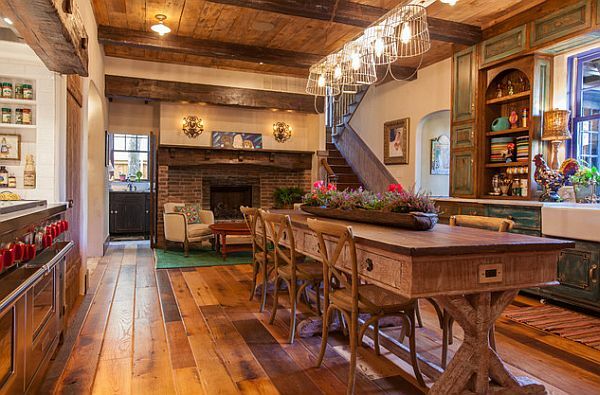 And such a rustic space calls for a rustic vessel to be displayed. Nice use of flower selections. The scale, color and textures harmonize with the room. Lastly, if you are still feeling unsure about what to add to your dining table…then you really can’t go wrong with a simple glass vase(s) filled with a few stems of flowers. This alone brings a life energy to your table and will bring simple beauty to your dining experience. Most importantly….just have fun experimenting with what flowers YOU like best on your table! If you like it…most likely, your guests will too.